What have I learned from creating content for the internet? One thing is crystal clear: if you want people to discover your work, you need search engine optimization (SEO). Take this article for example, if you search for “reverse engineer Google,” “seo secrets,” “reverse engineering seo,” this article is on the first page for each of those search terms. Talk about meta. SEO isn’t magic, it’s knowing what to do. Whether you’re an SEO newbie or a seasoned practitioner, I encourage you to fully read this to understand how you can get your content on top of search results. It’s meant as a solid foundation to SEO. There are lots of essentials to discuss and juggle, and I will distill the information in plain English. Join me and let’s delve into the minds of Google search engine programmers and reverse-engineer how they analyze, judge, and rank content. We’ll do this through a combination of intuition and logic, and not necessarily empirical analysis. Attempting to game or cheat Google’s algorithm with this information will only backfire on you, because as an engineer, that’s what I would do. Let’s start with an essential question: What is SEO? Translation: SEO is all the things you have to do to get your website ranked high in search results, without paying for it. Next question: What is Google.com’s goal? Google’s number one priority is to make sure a search inquiry’s results are accurate and relevant. The happier users are with results, the more likely they’ll keep coming back and remain loyal to Google. Think of Google (Bing, Baidu, Yandex, etc.) as librarians. They categorize (index) many books (websites) in libraries around the world (internet). It’s their job to find the exact (relevant) book you’re looking for. They are very good at this and that is why Google is number one in search. 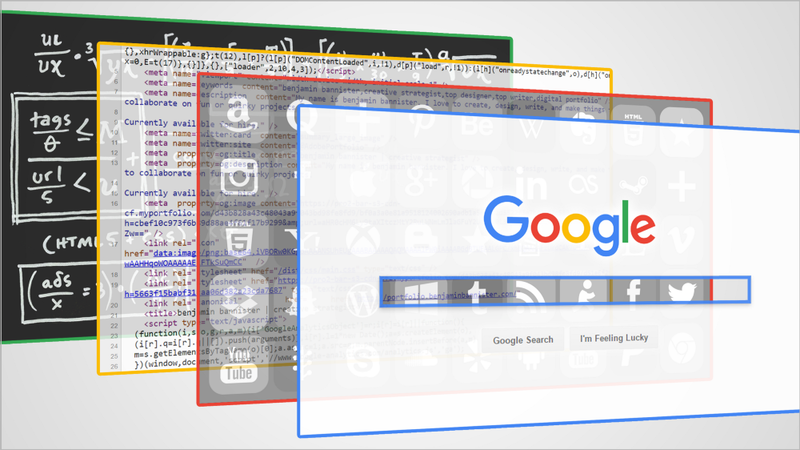 To have gotten to this point, Google created a complex algorithm (to be now referred to as ‘The Algorithm’), with top-secret variables that judges websites, and ranks them based on their content. Have you ever searched for something and found exactly what you wanted, and then started another search, and before you could type three letters Google has already predicted the next thing you planned on searching for? That’s the brilliance of The Algorithm. It can even predict what you want based on the context you previously searched for! Great SEO follows guidelines that Google determines are best practices to have your content ranked on top. Unless you work at Google, no one truly knows what these variables are. But there are clues to extrapolate what they might be. You may have been told, “Content is King.” If you think about it, you can make all the content you want, but it doesn’t automagically make it good. No, the real word here is quality. Quality is King. This concept should be clear and ingrained into your head, and should be the number one priority when creating content. If your content isn’t doing one or more of these things, then why are you even trying? Start by creating something that provides value, lasting value. Not some “mission statement” page, not some “about us” page. Actual. Quality. Content. You can follow almost every point on this page to 100% accuracy, but if the quality isn’t there, then good luck to you. If you forget that quality content is a top priority, then you can forget about having an SEO strategy. HISTORY LESSON: In the Old Days, the internet was littered with “content farms.” These websites took quality content and aggregated them on their own ad-filled sites, with the goal of getting traffic, making money, and topping search rankings (and they still do). Quality still ranks at the top, the only difference now is The Algorithm favors the original creators, and their work deservedly shows at the top. Google likes to provide search results that have value. Whether it’s a tutorial video, a funny article, or an amazing photo series, it’s possible to create something of quality that benefits your brand’s bottom line, and, benefits your audience. Win-win. If Google sees that a lot people are sharing your content, it considers it as potential QUALITY. Are Sharers Relevant to Your Content? Part two of sharing is: Is your post being shared by related sites? Is your video on “The Future of Design,” being shared by designers and creative people? Is your article about “A Possible Cure for Cancer,” being shared by doctors and established institutions in the medical industry? If Google sees that related sites are sharing your content, it considers it as likely RELEVANT. EXAMPLE: You have a food connoisseur friend and a college professor friend. They both recommend the same new restaurant. You are likely to listen to both, but whose opinion will have more impact? Who is more relevant? HISTORY LESSON: Old SEO advice suggested you connect with websites and trade links with each other. True, a big legit site linking to you can boost up your ranking, but, it won’t help your relevancy score if the linked content isn’t related to the site sharing it. Sorry, if your site is about kittens and you share someone’s link to making roasted broccoli and vice versa, as Google, I would think both of you are just colluding with one another and I would deduct one house point from both of you for irrelevancy. Obviously, people and brands share all types of content. The ones with a true identity — that know themselves, know to share things that fall in line with what they are representing. If you share, keep it relevant. A simple way to show relevancy in your brand is through crosslinking. If you have accounts on several networks and want Google to know they are all related to you, link them together. EXAMPLE: If I have a YouTube, Twitter, and Behance account with the same name, i.e. BravoEcho, make sure your main site, BravoEcho.com, has links to your YouTube, Twitter, and Behance accounts. Do the same for those separate networks. This lets Google know that the BravoEcho on YouTube, is the same BravoEcho on Twitter and Behance. Make it easy for Google to know you are the same entity. I only have one caveat here: do not crosslink if you have empty content. i.e. : If you link your Facebook page to your Twitter page, but your Twitter profile doesn’t have any tweets, that is just bad UX (user experience). Make sure your platforms have content if you link them. Cross linking is simple and easy to implement. So do it. Keywords, or search terms, are what Google uses to index your site. While keywords do not hold the same weight as they used to, they are still necessary. Your choice of words and keywords on your page matters. Every. Single. Word. Filling your page with search terms just for the sake of filling it is not impactful nor helpful to Google (and you will get a deduction for deception, and you know I’m all for deducting house points!). HISTORY LESSON: “Keyword stuffing,” used to be a thing where keywords were repeated over and over ad nauseam throughout a page to trick search engines to think that because a site has certain words so many times, that that site must be about those keywords. Not anymore. It’s not easy to get this trifecta. Don’t let this point hold you back from a good title, but do take it into consideration. Use keywords in your title that people are likely to search for. EXAMPLE 1: I had a tough decision in naming this article. I could’ve had something simple and effective like, “SEO Secrets Everyone Should Know,” or, “9 Powerful and Essential SEO Tips,” but zzzZZZZZ, snooze. As for length, there are no strict rules on how long or short a title should be. The title of your content should be as long as it needs to be (but don’t make it too long). EXAMPLE 2: I can’t deduct points for a long technical title if it needs a long technical title. I can’t deduct points for a short title if it describes the content accurately. In addition to keywords in your title, there is the meta description tag in your html code. These differ from meta tags. Google and most search engines to do not use meta tags for indexing (but they use it in some context). “Oh, this site MUST be about iPhones because it’s mentioned A LOT in the tags and content.” Sorry, no. Google has smart programmers who see through this immediately. They don’t use meta tags. Write out an accurate and optimized meta description. This description tag allows Google to index your page accurately. It’s not always used, but it’s a factor. Do not mislead here (do not!). If you attempt to misdirect, it will count against you in search rankings. Because why? Because that’s what I would do. The above is a perfectly fine URL. It uses the main keywords in the title to reinforce the topic and for consistency. I limited the duplication of this phrase to the title and the custom URL. The shorter the URL is, the less likely it will look like keyword stuffing, and the less likely it will be automatically truncated by some websites. Do you see a difference? The first link clearly describes the content, the second is some randomly generated link. Google is not going to understand what gibberish numbers and letters are in your URL. Make it clear for them. TIP: Use a dash (-) between words when naming web links and files. It helps Google separate the words. i.e. : website.com/your-cool-product.html. To summarize keywords/meta tags/URLs: Be accurate, interesting, and searchable. I like to include images when I can. Accurate and relevant naming of your images reinforces your content, and also becomes indexed in Google’s image search. Like naming the title of your content, two things matter in photos: the name of the file, and the caption you give it (or the text around it). EXAMPLE: If I took a picture of Diamond Head in Hawaii, I would probably name it “diamond-head-hawaii-benjamin-bannister.jpg.” I could also add the words “volcanic-tuff-cone” in there, but it could count as keyword stuffing. I can add that as a caption instead. I personally include my name if I create a graphic. However, if that makes the file name too long, I take it out. Again, relevancy is key. It’s important that the file name and caption/surrounding text accurately represents the picture. NOTE: If you post to other sites, they may automatically rename your images. Don’t let that bother you. Keep naming files with consistency. Gone are the days where you could write a 300-word piece, throw in some links to other popular content, and end up at the top of the charts. Google sees this as “thin content.” You are probably aware of them when you encounter them as they leave you wanting more. Now, more points are given to content that has meat. I want a thick, juicy, medium-rare piece of meat to chew on, with very little fat. That was a metaphor. That doesn’t mean everything has to be epic in length. Google wants pages that give people exactly what they want, not pages that are longer than necessary or that slows down user experience. EXAMPLE 1: If someone is searching for the definition of a technical term, don’t spend three paragraphs meandering until you define it. Define the word. You can add related words and context examples, but that word definition should be the first thing a user sees. EXAMPLE 2: If someone is researching “how to report a plant,” I would expect the articles that rank on the first page are all concise, with enough depth to give the answers you’re looking for. If you write articles, read and reread and learn to axe unnecessary words and sentences. If you make videos, cut out the ums and uhs, and get to the point. Don’t waste people’s time with unnecessary filler; ain’t nobody got time for that. Every creator loves their work but they should know when to edit themselves. People don’t want scraps or fat, give them a delicious lean steak or a bite-sized rich dessert, whichever serves your content best. A site that is well-designed, intuitive, and easy to use, will get points for being properly made. If you have confusing navigation, links that lead to broken/missing pages, navigation that requires more clicks than necessary, then it means you’re not maintaining it or hiring a proper web architect. UX is a very in depth topic on its own. To keep it simple, having a website with great UX is like having an ergonomic chair. Make sure your chair is comfortable and natural to use. I shouldn’t have to think about how to use your chair. Terrific UX on a computer should be similar: nice to look at and intuitive to use. If you can’t jump into a new system and figure things out like that (snaps finger), then the designers didn’t do a good job with the UX. Another part of good UX is not being flooded by ads on a page. Yes, businesses and websites need to make money, and they make some of that with ads. It’s a necessary evil. However, when you position your ads between your content, that does two things: it confuses the audience to think the ad is part of the content; and it annoys the hell out of them (and brand loyalty starts going out the window). NOTE: One could debate placing ads that look like content for good design aesthetics. That’s fine, to an extent. But when you sandwich ads between written content to make it look like it’s part of it, or have a huge graphical ad banner indistinguishable from actual content, you’re trying to deceive. How would Google know the difference? Google knows. Then there’s the sin of having too many ads on your site where the question becomes: “is this a page of content, or a page of ads?” There is a fine line to walk between giving an audience good content, while still making enough money to run your business. And lastly, we have the ratio of ads to content. Five ads for a paragraph of content? (GTFO, minus 15 points.) One ad for a paragraph? You’re fine. Consider coding ads that are responsive (automatically adjusts) to the amount of content. Keep your ad ratio in check. And definitely do not auto-play video ads on a page (minus 10 points, Ravenclaw). That’s all. Google has gotten smart to those that copy and paste popular content (usually without permission), onto their own sites in hopes of getting traffic and ad revenue (minus one hundred points in Life if you do this). Sure, you’ll get your AdSense money, but you won’t be ranked higher in results. Google knows who posted it first. Thank goodness for timestamps. The person who posted it first is considered the original source, and will in turn be ranked higher. Anyone else who has the same content is considered someone that copied it or shared it, no matter their numbers. Being first may not go into effect immediately, but The Algorithm will course-correct as time goes on and as more data is collected. EXAMPLE: You have a photo series of Disney characters as (insert noun), and post it on Behance, Tumblr, and DeviantArt, in that order. That is the likely order Google will sort them over time. Continually create. It doesn’t have to be every day, but enough to give your audience a steady flow of you and your brand. Google wants fresh content on top. Think of this like a supermarket putting new milk behind the old ones. Let people know you continually produce milk and it’s fresh. EXAMPLE: If you wrote about “Best Laptops of 2016.” Guess what? “Best Laptops of 2017,” will rank above you. For me, I try to create rich, quality content at least 1–2 times a month. For you, that might be a different number. As a recovering perfectionist, I urge you to just post your creations. It doesn’t have to be perfect, and on most platforms (except video), you can pull George Lucas’ and keep editing and refining (like I do). If you’re always updating your blog or site with well-researched and in-depth content, you should expect improved rankings. Sites that publish sporadically can expect the same irregularity in their rank positioning. Produce a steady flow of fresh content. Once you get on a regular schedule it will be easier to maintain. Google seeks to provide quality content that answers user inquiries. Content that is linked and sourced by lots of credible sites boosts its authority on the subject. And content that is properly key-worded in the right places will make it indexable for search engines. Google does not have time for books (websites) that say one thing on the cover (code), but end up being something else (not relevant). Do not mislead Google. (Here’s a list of things you should not do.) You do not want to be on their blacklist, which basically means you don’t exist. The above points are the most important variables for search engine optimization. Some you have control over, some you don’t. If you succeed on all points, you won’t have to worry about whether your content will show up on at the top of listings, it should get there on its own, organically (and again, a marketing budget helps). No matter how many times Google tweaks or evolves The Algorithm, from Panda to Penguin to Polar Bear, these logical and intuitive core SEO tips should remain timeless.